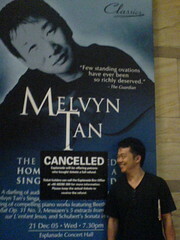 But seriously though, I am sorry Melvyn Tan has had to defer [not my choice of word] his performance at the Esplanade. Author Mr MiyagiPosted on December 4, 2005 January 6, 2007 Categories Army / National ServiceTags Army, National Service13 Comments on Melvyn Tan mobilised! On Thursday night, mrbrown, James Seng, Xiaxue and myself made arrangements after work to attend Sondra’s wake. It had been a difficult afternoon, trying to juggle work with the weight of the news of her passing. We met members of her family and mrbrown explained a little about who were were – Sondra’s family didn’t quite know the extent of her online life, much less her involvement with Tomorrow.sg. It may have surprised them a little to see us, as well as bloggers from the Cowboy Bar fraternity. We left a little after 10pm to look for something to eat, and found ourselves at McDonald’s Northpoint as it was the only place left open. (The KFC manager said ‘no more chicken’, because ‘we don’t cook the chicken here, they have to bring it here’). Over our burgers and shaker fries, me and mrbrown found ourselves talking about everything. A lot. We ate, we laughed, and we laughed some more when I dropped my burger on my lap. On the way home, I told mrbrown that maybe we needed that – to remember the importance of ordinary things, the simple things. iTunes is playing an illegal copy of Living a Little, Laughing a Little from the album “Living a Little, Laughing a Little (1974 – 1985)” by John Hiatt & Elvis Costello of which I have the original CD. La Idler, aka Sondra, aka Fembot passed away yesterday.